The Yashica ME 1 is a small, compact 35mm viewfinder camera with auto-exposure, made in Japan originally in 1970 and later was probably the first camera produced in Brazil by Yashica from 1977. Black. The focus zone settings are visible in the viewfinder through a small square window, below the finder window. Behind the focus ring is an aperture ring - with an "A" setting for automatic and stops from f2.8-16 for flash. 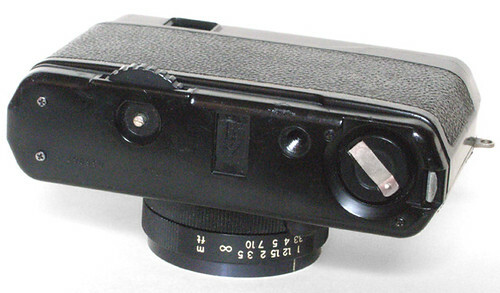 Film advance is by a thumb-wheel on the lower left of the back. The film speed is set using a ring around the lens, with a display just below. The CdS photocell is just above the lens, inside the filter thread - allowing the auto-exposure to compensate for filters. The top plate carries the shutter release, hot shoe and frame counter. There is a lever for the self-timer on the front. There is a Tripod screw point but no cable release point. Lens: Yashica 38mm f2.8; 4 element, 3 group. 46mm filter thread. Shutter: Copal auto, speed set by metering, 1/60-1/360 sec. 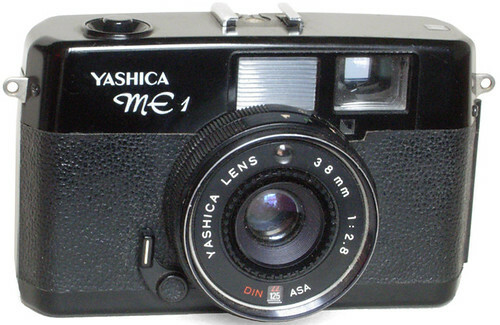 Overview of Yashica Snapshots on Yashica Guy's website including the ME1. This page was last edited on 5 April 2019, at 05:45.